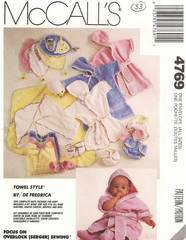 McCall's sewing pattern 4769 for infants' hooded robe with attached tie belt, hooded bunting with front zipper, hooded kite wrap, bib in two styles (with optional applique variation), diaper cover and booties. All items can be make from purchased towels or fabric. Includes Size Newborn (up to 14 lbs), Small (15-20 lbs), Medium (21-28 lbs) and Large (27-32 lbs). Uncut and complete. Copyright 1990.